The business logic is solid for doing such an expansion but equally important is the opportunity to provide high-impact social change to the Northeast region of India. We believe in profits with principles. This region between Bangladesh, China and Myanmar has not developed economically as much as the rest of India. There is a high rate of unemployment and few available jobs yet the people are well educated and most often, English speaking. Chillibreeze also sells ready made easy to edit maps. Chillibreeze is pioneering in Northeast India in a way that may be the model for other IT or IT-enabled companies to follow, thus helping to bring prosperity to this beautiful part of India. Chillibreeze has entered not as outsiders but in collaboration with local businessmen who were born and raised in this area. Chillibreeze first collaborated with Grace Systems, a well-established IT company located in Shillong. They too have a vision for Northeast. Stylus Systems in Bangalore helped kick start Chillibreeze's activities in Shillong, when it employed one Khasi man from Shillong and one from Nagaland. The Chillibreeze venture was done with the full participation and acceptance of local government and civic leaders from the area. The venture's goal is to bring with it blessings to this region and beyond. Our vision document directly parallels the vision document prepared by the government of Meghalaya. Our vision and the government's vision put hope in people and cutting edge technology into the region. We believe what Thomas L. Friedman has said, "Connectivity equals prosperity." New methods of communication can help bring this area of India into the global digital economy and help all segments of society-especially-the disadvantaged. It is our goal to open up global markets bringing prosperity and preventing exploitation. This will be done by helping the region gain fair access to global markets primarily by using the Internet. Therefore, in addition to Chillibreeze becoming a model of business excellence and business ethics, we will, at the same time, create other means to facilitate the vision of bridging the digital divide and entrepreneurship in Northeast India. Read more about our mission statement and how Chillibreeze has impacted the region. Please feel free to contact us. Inquire about joining our team at our Shillong division located in the Software Technology Parks of India (STPI). 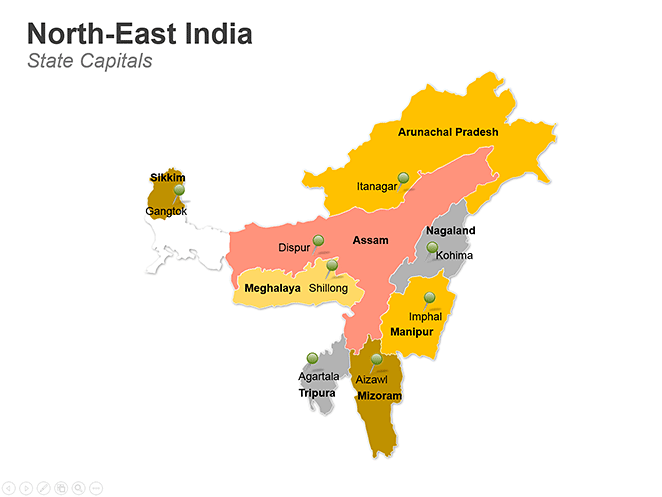 We believe the time is now for Northeast India! Entrepreneurs use our ready-made PowerPoint VC template to quickly create a presentation.